Earn up to 1,672 reward points. Tone shaping for any signal source with a Drive control, footswitchable bypass, and SansAmp circuitry. 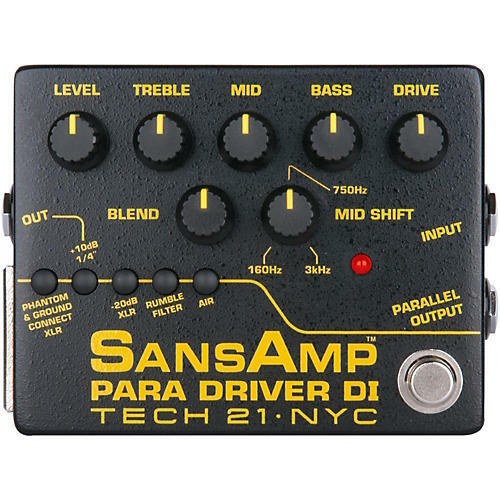 The Tech 21 SansAmp Para Driver DI Instrument Preamp Pedal provides detailed tone-shaping possibilities for acoustic guitars, electric guitars, and electric and upright basses, either direct to a mixing console or with an instrument amplifier. The Para Driver DI gives your instrument a natural warmth and presence, as if miking it through a tube preamp. The SansAmp circuitry eliminates the harsh, unnatural harmonics of piezo pickups, while the Drive control offers some edge-- ranging from just a little to over-the-top.